With 517bhp and 620Nm of torque coming from a 6.2-litre V8 the Black should turn plenty of heads with the noise it makes alone, but it’s also got beefed up styling to match the performance and the soundtrack. A new front splitter, wider track, rear diffuser, restyled side-skirts and outlets behind the rear wheels all add to the appearance of the Black Series Coupe, which is styled after the SLS AMG GT3 race car. The links to the SLS AMG aren’t superficial, though. The engine shares various components with the gullwing supercar, including the pistons, connecting rods and crankshaft. Coupled with a new ECU the increased power output of 517bhp can propel the Black Series from 0-62mph in 4.2 seconds – luckily the brakes have been retuned to keep that performance as safe as it can be. The interior features front bucket seats, and the rear seats have been removed to reduce weight. 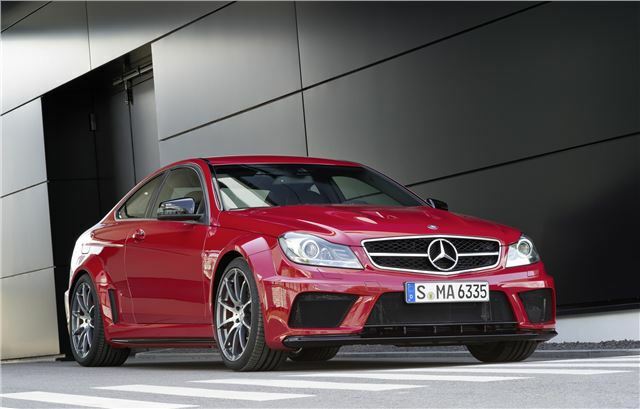 Red details including stitching, seatbelts and details on the doors, armrests, and centre console, along with a ‘Black Series’ logo on the dashboard trim, set the Black Series model apart from the regular C63 AMG Coupe. Prices are not available at this time, but deliveries should start in early 2012.